In 1958 the SA-75 Dvina high-altitude air defense system and the MiG-19PM interceptor aircraft with RS-2U air-to-air missile entered the service in USSR. 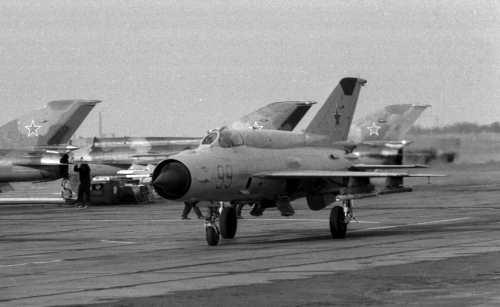 A few years later the Su-9 ‘Fishpot-A’ and the MiG-21 ‘Fishbed’ all-weather, missile-armed interceptor aircraft arrived too. 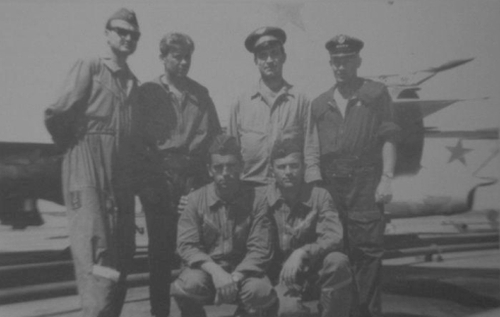 In the early sixties, the independent Air Defense Armies established. These contained air defense command post, anti-aircraft missile units, fighter air regiments and radio technical units together. 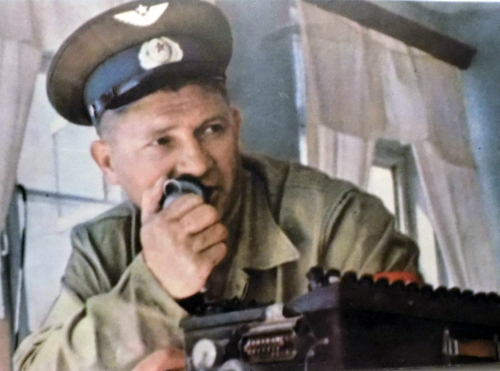 There was a need for training centers where units of the air defense corps were able to carry out complex tasks. 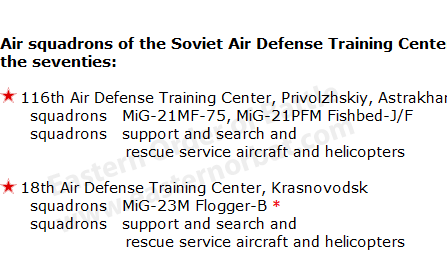 In the late fifties, the Soviet Air Defense Command established more training centers. 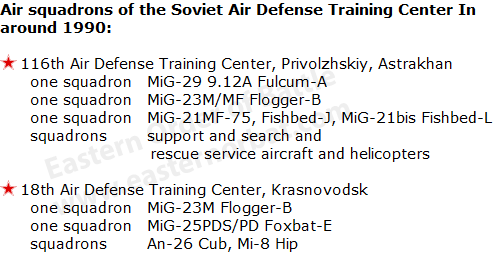 The Soviet air defense fighter force used two air defense training center, the 116th Center at Privolzhskiy, Astrakhan military airfield nearly the Volga river and the 18th Center at Krasnovodsk airport next to Caspian Sea eastern coast. There was a training range close to each one, where anti-aircraft missiles and radio-technical units were installed. The entire Kazakh desert was used as a shooting range. Combat air units could also practice than single, or they could work with their own anti-aircraft missiles and radio technical units, on complex combat training. The Eastern European Warsaw-Pack country's air defense divisions used both Soviet training centers too. 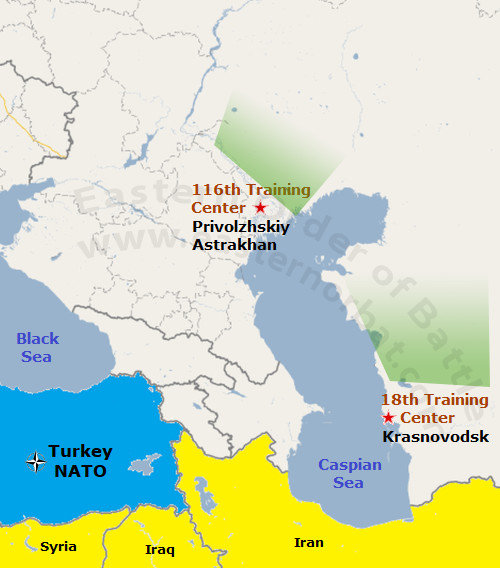 Every two-three years each Soviet and Warsaw-Pack's air defense division or corps practiced on the 116th or 18th training center. 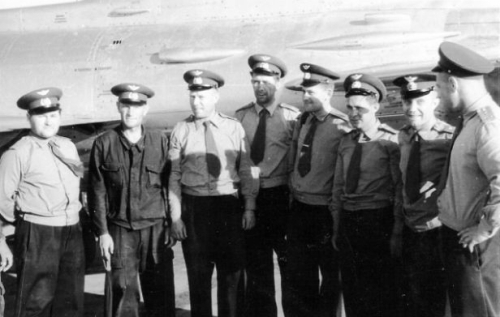 The Soviet fighter air regiments were deployed with its own airplanes to Privolzhskiy or Krasnovodsk airport. 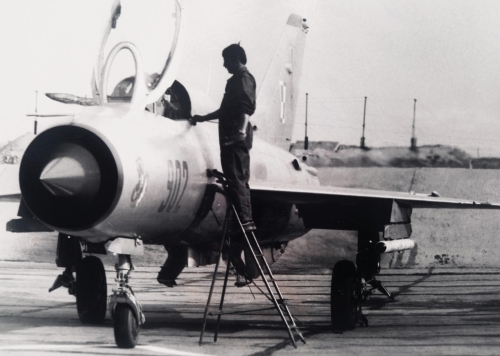 The Eastern European Warsaw-Pack country air defense forces sent only their crews and air to air missile in the sixties and seventies. 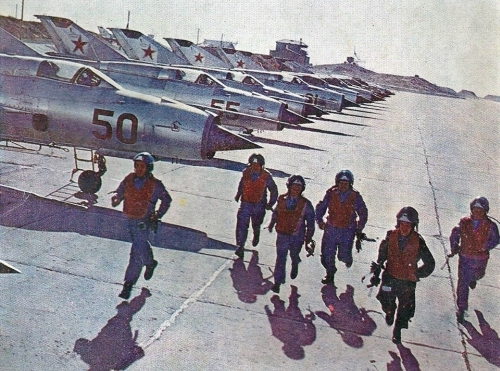 The Soviet Union guaranteed the appropriate fighter aircraft, therefore the two Soviet training centers had MiG-19PM ‘Farmer-E’ and MiG-21F-13 ‘Fishbed-C’ and MiG-21PFM ‘Fishbed-F’ fighter aircraft in the sixties. The RM-3V ‘raketa-mishen’ target-missile, served as an aerial target. 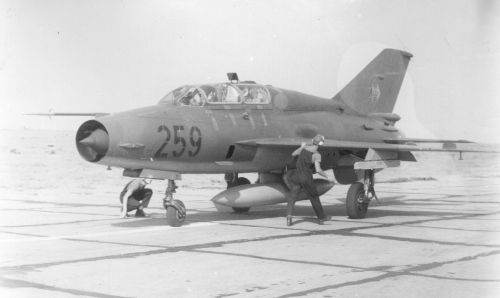 At the MiG-21 'Fishbed', the wingman could launch the RM-3V missile-target too. 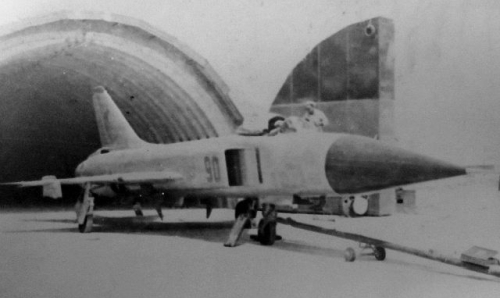 Lavochkin La-17 was the first Soviet unmanned aerial target. The La-17 was directed by radio control. MiG-15M ‘Fagot’, MiG-17M ‘Fresco’, and IL-28M ‘Beagle’ was an absolute realistic airborne target. Many of the old aircraft after service life were converted to target drones. In the sixties, they practiced the intercepted of high altitude and high-speed targets. From the late sixties, new and air defense system arrived. S-200 'SA-5 Gammon' very long range, medium-to-high altitude surface-to-air missile system. S-125 'SA-3 Goa' shorter range and lower altitude, surface-to-air missile system. Sukhoi Su-15 Flagon, Tupolev Tu-128 'Fiddler' long-range interceptor aircraft, MiG-25 'Foxbat' high-speed air defense fighter with new R-8 'AA-3 Anab', R-4 'AA-5 Ash' and R-40 'AA-6 Acrid' long-range air-to-air missiles. There was a need for new practice, battle process and new type airborne target at Ashuluk Range. 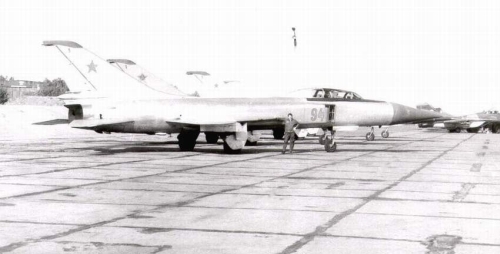 In the seventies, the 18th Air Defence Training Center replaced their MiG-19PM fighter to MiG-23M type. 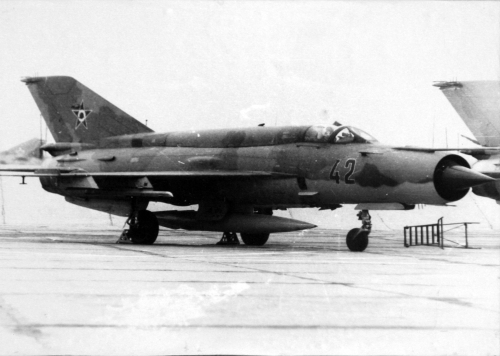 And the 116th Center received one squadron new MiG-21MF-75 ‘Fishbed-J’ export version fighter in the middle of the seventies. 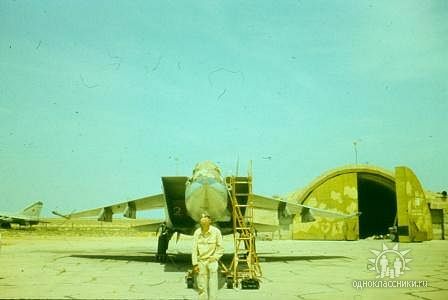 A guest MiG-25P 'Foxbat-A' unit at the Privolzhskiy, Astrakhan airfield in 1973. 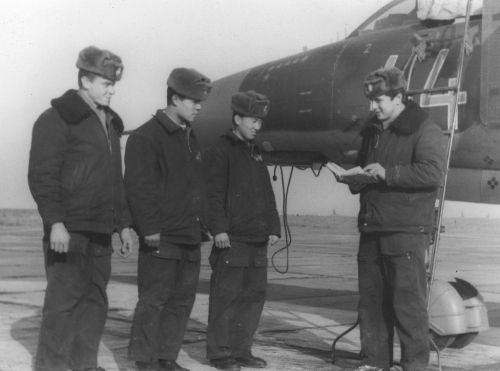 In the background the local 393rd Guard Fighter Air Regiment PVO's Su-11 'Fishpot-C' interceptors. The local fighter regiments of the Baku Red Banner Air Defence District (393rd and 179th Guard Fighter Air Regiment PVO) helped the training center. They often flew as a high-speed air target. The split usage airports were already overcrowded, therefore at the end of the seventies, Astrakhan's civil air traffic moved from Privolzhskiy airport to a new airport. At the same time, the 179th Guard Fighter Air Regiment moved from Krasnovodsk Airport to PVO Nebit Dag Airport. 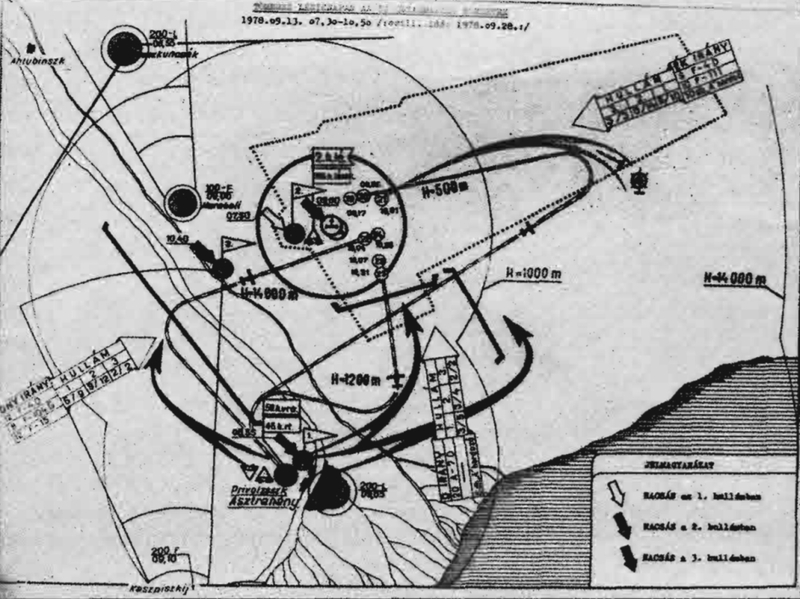 In the 1970s, air defense division or corps conducted very complex exercises at the training centers. The picture below shows you the Hungarian Home Air Defence force's 'STRELBA-78' exercise plan. In 1978 the Hungarian 2nd Home Air Defence Division's units were deployed to the Soviet Union. The 59th Home Fighter Air Regiment's pilots, ground crew, air traffic controllers and command post officers arrived at Privolzhskiy, Astrakhan airport. Meanwhile, the 105th Anti-Aircraft Missile Regiment and radio technical units traveled to Ashuluk training center north of Astrakhan. The targets needed to be shot down between 500 and 14000 meters. In the seventies, they already used the high speed RM-207 airborne target too, which imitated the USAF high-speed Boeing AGM-69 SRAM nuclear air-to-surface missile. 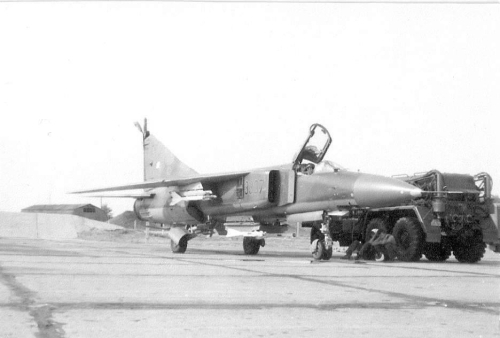 In the first half of the eighties, the 116th Center got MiG-23M/MF 'Flogger-B' and a small number MiG-21bis 'Fishbed-L' type. The Eastern European Warsaw-Pack Air Defence units could practice with R-23 and R-24 'AA-7 Apex' missiles. With these rockets, targets could have been attacked while flying towards them. They could also practice this at 116th Center on MiG-23MF 'Flogger-B'. In the second half of the eighties, the Eastern European Warsaw-Pack Air Defence units traveled to Privolzhskiy, Astrakhan airport. 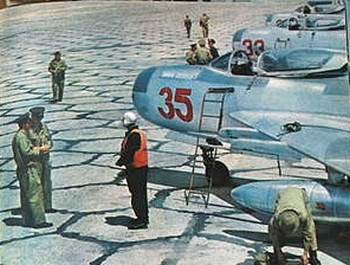 Similar to the Soviet units, they used their own aircraft. 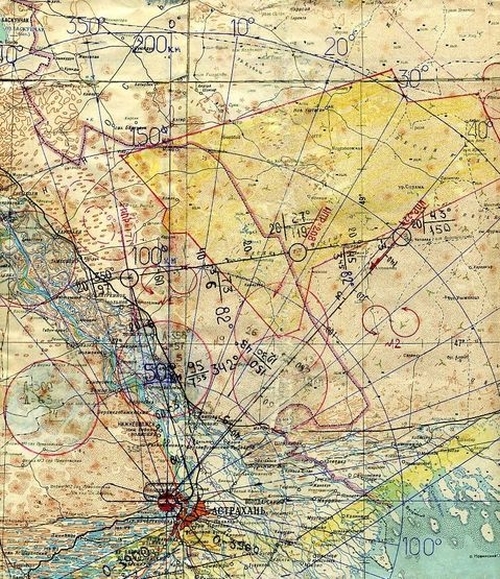 They practiced long-term navigation from eastern Europe to the Caspian Sea. 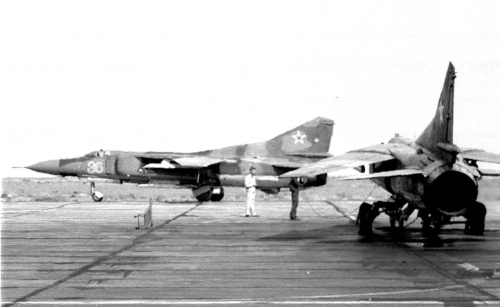 Soviet MiG-25P ‘Foxbat-A’ high speed interceptors air unit at Astrakhan airport in 1981. 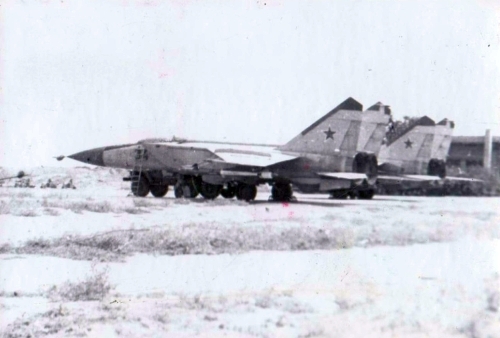 Warsaw Pact pilot training MiG-21PFM ‘Fishbed-F’ and MiG-25PDS ‘Foxbat-E’ of the Soviet Air Defense at Astrakhan training airport in 1988. 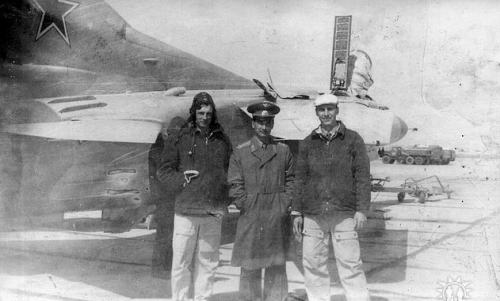 Cuban military crew in front of the 116th Center’s MiG-21MF ‘Fishbed-J’ at Astrakhan airfield. In 1985, a tragic accident occurred. 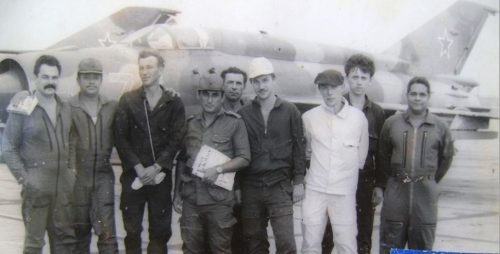 One of the Cuban pilots accidentally shot another MiG-23 aircraft. 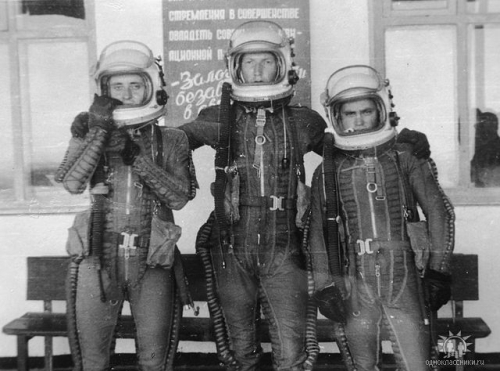 Soviet air defense pilots at Krasnovodsk 18th Tarining Center in the early eighties. In the late eighties, th 116th Center got one squadron modern factory new MiG-29 9.12A 'Fulcrum-A' fighters. Then the 18th Center received one squadron MiG-25PD/PDS 'Foxbar-E' high-speed interceptor fighter around 1990. In the early nineties, Russia lost the Air Defence's 18th Center and the Tactical Air Force's 1521st Center. Their tasks were also taken over by the 116th Center from the nineties.